Windstream Login, Late Payment Fee @ www.windstreamonline.com Bill Pay: The Company provides voice and data network communication services and managed services such as cloud based services, virtual servers, networking solutions, firewall, data storage etc to businesses in the United States. It also provides broadband internet, phone and digital services to over 8.1 million residential customers in 21 US states. You can access your Windstream customer account online. It is very easy to manage your account with online access. You can view your bill; pay the bill, view bill history, check data usage and balance, sign up for auto pay and paperless bill and much more. In order to access your account online, you need to login to Windstream account with your username and password. In order to have your login id, you have to register an account for the first time. To register an account, you just go to www.windstreamonline.com/pol/Registration.action and provide information as instructed. Once registered successfully, you can login to your account anytime. Windstream offers several bill payment options; you can choose that suits you the best. 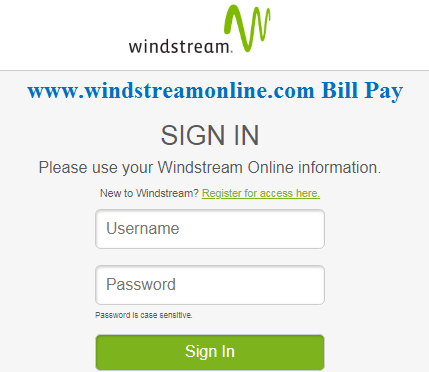 Customers can pay their bill online by Windstream Login in to their account. Online payment is much convenient option as you can make payment anytime being anywhere. You can pay through credit card, debit card, checking or savings account. Your payment will be credited in a day. You can also set up for automatic payment; your bill amount will automatically be deducted from your account mentioned on due date every month. It is a hassle free payment option which ensures that your payment is made on time. If you don’t want to pay online but want to make quick payment, you can pay over phone. You just call at the number at 1-866-445-5880 and make payment as guided by the automated response system. It is a free service. If you want a customer representative to make your bill payment process; then you have to pay service charge. Customers can pay their Windstream bill through regular mail. You can send a payment check along with payment stub to the mailing address: Windstream, Post Office Box No. 9001908, Louisville, KY 40290-1908. Write your customer account number on back of the check. It will take few business days to process your payment. You can go to any of the company store or authorized payment centers and pay your bill. You can find nearest payment centre online at www.windstream.com/Store-Finder/. Just enter your city, state and click on the ‘Find’ button. If you have any question regarding Windstream bill payment, you can call customer representative at 866-445-5880. To know more, you can also refer to official website at www.windstream.com.